Meaco 12L Low Energy Review - How Much Could You Save? The Meaco 12L Low Energy dehumidifier is part of their ‘Platinum’ range. The Platinum range was formed by Meaco in late 2013 and its purpose was to produce high-quality machines that through good design consume surprisingly little energy. 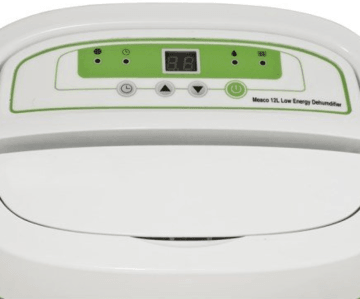 In this Meaco 12L review we’ll take a closer look at the ‘low energy’ claim and compare the machine as a whole to what is undoubtedly its closest rival, the EcoAir DC12. So, is the Meaco 12L a wise purchase? Let’s begin this review by looking at Meaco’s ‘low energy’ claim. The machine is rated at 165-Watts, which is well below its rivals. For example, the EcoAir DC12 is 230W and the DeLonghi DES12 is 180W. One thing to note is that the DC12 has two fan speeds, whereas the Meaco 12L only has one, which accounts for some, but not all of this discrepancy. A 165W machine costs about 2.5 pence per hour to run on maximum (at 15p/kWh), and this low figure looks even smaller when you consider that a dehumidifier should only be required to run on maximum for a few hours per day, with the machine requiring less energy to run during the rest of the day. You save 0.23 pence per hour versus the DeLonghi DES12 and nearly 1p per hour compared to the EcoAir DC12. While these amounts sound relatively small, they’ll add up. The savings are even greater when you compare the machine to desiccant dehumidifiers, which are much more energy-hungry. 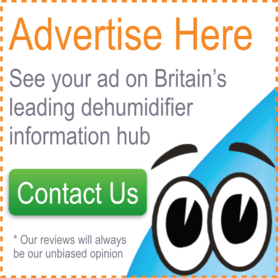 The most popular desiccant dehumidifier on the market can require as much as 580W, which represents a running cost saving of over 6p per hour. The other consideration with regards to the energy consumption is Meaco’s patented ‘control logic’. 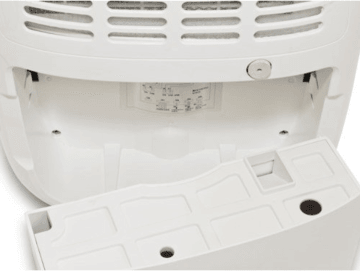 The difference between Meaco’s ‘control logic’ and non-Meaco dehumidifiers is that when a non-Meaco dehumidifier reaches the desired humidity it will stop dehumidifying but will carry on running the fans continuously to test the air. When a Meaco dehumidifier with ‘control logic’ reaches the desired humidity, it will run the fans for a further ten minutes to check that the humidity is stable before turning the fans off completely, saving energy. It will then switch the fans on for five minutes every thirty minutes to check that the humidity hasn’t risen. So with the ‘low energy’ claim justified, does the control panel continue the good news? Well, it does. What we like the most about the control panel is the digital display, which allows you to select a specific relative humidity in 5%RH increments from 30%RH. Meaco recommend 55%RH for general use, which we’d agree is the right level for the home, although in particularly cold weather it would be a good idea to drop this to around 45%RH to stop condensation forming on the windows. 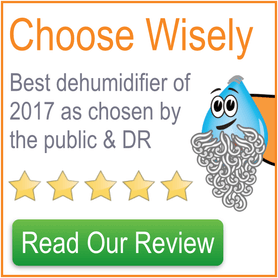 Some rival dehumidifiers have simply a low/ medium/ high option for humidity, so it’s great that Meaco give much more freedom here. Also on the control panel is a timer option that allows you to set the machine to run for a certain number of hours. This is useful if you’re using the dehumidifier to dry clothes and you don’t want it to run all day. There isn’t a specific laundry setting with the Meaco 12L, however you can set a very low humidity, say 30%RH, which will work in a similar way by keeping the machine running almost continuously. Despite this work-around, with only one fan speed the machine will dry clothes slower than those with two speeds. However, this omission does keep the running costs lower and it still drys clothes pretty quickly. There’s a manually adjustable louvre, so you’re able to point the dry air in a certain direction should you wish. This can be useful for drying laundry or targeting a particular spot of mould. There’s a ‘tank full’ light on the control panel, but other than that there’s no way of telling how much water the machine has collected, other than by opening it up to have a look, or through your own intuition. The water collection tank is 2.5 litres, which is better than rivals that average roughly 2-litre water tanks. It doesn’t have a handle so you need to carry it with two hands, but there is a lid, so the chance of spilling it are small. If the machine is sitting above a sink then there’s a continuous drain valve that can be employed with the correct length of tubing. The Meaco 12L comes with a dust filter, which you should clean with a vacuum cleaner every couple of weeks to keep the machine running efficiently. There’s no ioniser or antibacterial filter that come as standard, although these are relatively rare to find on refrigerant dehumidifiers. The final point to mention here is that by pressing the up and down arrows at the same time there’s a child lock that is activated. This is a feature rarely seen on dehumidifiers. 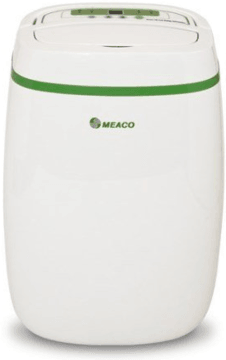 For a refrigerant dehumidifier the Meaco 12L is quite light, at 9.5kg. Coupled with a decent handle it’s not too difficult to move around. Size-wise it measures 48.5cm tall by 24.8cm deep by 32.5cm wide, which is average for its class, but certainly not small. In our opinion this is the best-looking dehumidifier that Meaco produce. The smooth ‘egg’ shape and solid green band at the top make it look quite modern. From a practicality perspective it could be better. The main gripe is that the water collection tank is accessible from the rear, which means that you either have to lean over the unit or turn it around to remove the water collection tank. There’s also no handle on the water collection bucket, so you need to be careful when removing it to not let the bucket tip over. Other than these points, the rest of the unit is well designed, with a special mention for the very easy to use control panel. Meaco state that the 12L produces a maximum of 44dB, which is kept low by having just one fan speed. Also the quality low wattage refrigerant compressor produces less noise that those of higher power seen in rival machines. You’ll know that the machine is extracting water due to the water droplet that illuminates on the control panel. 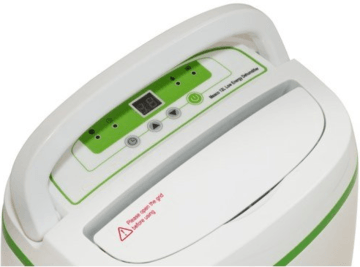 Meaco are well-known for producing dehumidifiers that perform well under UK conditions, not just the extremely favourable conditions that these machines are tested in, and the 12L is no exception. While it’s rated to produce 12 litres per day at 30°C and 80%RH it still extracts 6.2 litres at 26.7°C (80°F) and 60%RH, which is very good. When the room temperature falls below 16°C you’ll notice that the frost symbol lights up occasionally. This means that the machine is defrosting itself to maintain efficient performance and it will trigger automatically when the machine senses that frost is beginning to build up on the refrigerant coils. Considering its performance, we’d rate the Meaco 12L as suitable for homes up to 3-4 bedrooms in size. We rate the Meaco 12L very highly. This is for its low energy consumption, excellent control panel and efficient extraction performance. We saw the machine with a big reduction on price at this store, which coupled with the lower energy bills make it good value and a wise purchase.